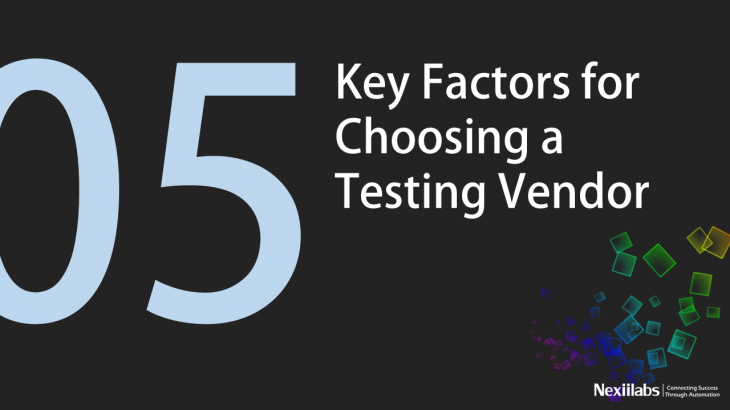 The financial as well as technical success and failure for many testing projects depends on choosing the right vendor. Understanding the key procedures can guide us to make a perfect and learned choices that help in choosing the best testing team. Before choosing a testing vendor, considering factors like testing strategy and reputation is important. Choosing the best provider is possible for the stake holders by following certain criteria for their testing project as well as the company. Before choosing a testing vendor, making sure that your short list of vendors should consist a well-established company which has enough experience in business and in forming an effective working relationship. Consider their involvement with various testing tools and their capacity to perform various testing procedures, for both web and mobile.Perfect candidates will be thought pioneers who can talk about developing trends in the market, such as cloud and Internet of Things(IoT). They should be able to suggest the best approach on either scrum or agile methodology which is suitable for the company’s project. Since communication is important for testing, you have to know that they work in a productive way. Get some information relating to their inward procedures and turnaround times. Services like project management, automation and consulting are to be considered while looking for a vendor with complementary services. Finding a vendor that has all products and services you need should be possible. Similarly, the chosen vendor should be able to understand your industry particularly when you work with banking and healthcare industries that usually include complex regulations and IT frameworks. Staff is another critical element to consider. Search for vendors that have experienced and skilled team of people. Legibility is one important factor while building a working relationship starting from the initial stage. Vendor should be able to expand the correct number of testers and tools to quicken a project without a compromise on service quality. This is more important for the projects that include changeable requirements and fixed schedules. Search for teams that offer a range of abilities and adaptability to work with you even if there is a change in the project shape. Hiring a beginner with low rates could wind up costing you time and assets down the line. Outsourced professional services are never low-priced.Cost is the primary element, but depending too much on this element may effect potential business esteem. Look for a cost-justified testing process and the key considerations on outsourced testing services. You need to consider the measure of importance and reliability your potential associates have in the market. This can indicate you on their overall capabilities and thought leadership. Usually well-established companies are considered rather than start-ups in light of experience level. Additionally make sure to check references with a thought of how every competitor delivers. Honors to the organization are a positive sign. Evaluating their client base is always better to understand the ability level and their areas of perfection. At long last, assess their customer base so you better comprehend ability level and specialized topics. Working with a vendor that is honest and reliable is necessary. They should always have the capacity to remain behind their choices and update you on the best strategy with regard to their services. Choose an accomplice that will assure liability for your projects and produce leading results. Each of these components can have a major effect in finding the correct vendor for your testing projects. If any of these is overlooked, you may have poor project results, raised cost and low performance. Consider these criteria at a beginning stage before you start ensuring the best value for money and right abilities for the job.